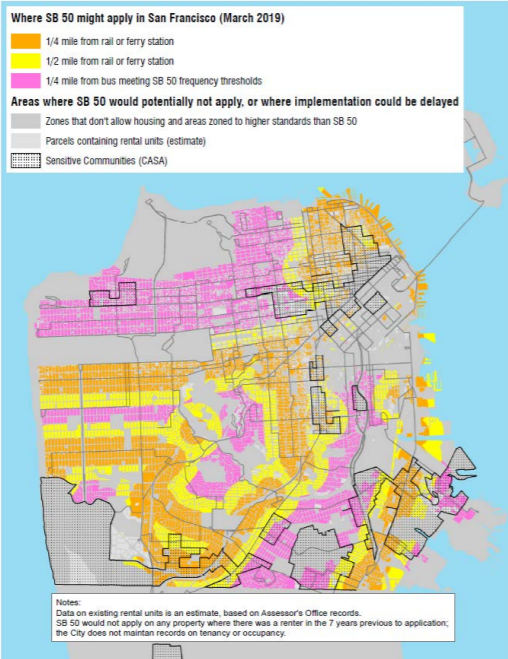 The Housing Rights Committee of San Francisco opposes Senator Weiner’s bill SB 50, which would up-zone almost the entirety of all the housing lots in San Francisco with particularly significant impacts on working class communities of color and LGBT communities. Upzoning and preemptions for local controls would further exacerbate the rampant speculation that has already negatively impacted low-income and moderate-income tenants, immigrants, seniors and families that make up the renters in San Francisco. The legislation requires that all residential zoning within a ¼ mile of a high quality bus line and ½ of a rail or ferry line be rezoned to greater density through adjusting height limits, increasing minimum FAR and waiving local density regulations. This legislation will affect neighborhood and residential land parcel in San Francisco. Real estate speculators will be able to extract tremendous value from parcels that were previously zoned for a single family home that can now be sold as a potential 8 unit apartment building. SB 50 does not have any provisions that capture this skyrocketing real estate value beyond reliance on San Francisco’s existing inclusionary housing policy. San Francisco’s current inclusionary housing policy only captures “public value” with new developments of 10 or more units. As of March 2019, San Francisco’s inclusionary housing policy has only resulted in 2750 units since the program’s inception. Assuming that San Francisco’s inclusionary housing policy remains the same, the majority of upzoned developments in RH-1 and RH-2 will not need to contribute to any type of affordable housing provision in San Francisco. According to the San Francisco Housing Balance Report, only 23% of housing built in San Francisco has been affordable to income ranges below 120% AMI which is 99,500 for a single person in the past ten years. SB50 will do nothing to address this deep deficit in affordable housing in San Francisco. ‹ Join our Happy Hour Fundraiser for Housing Rights!